Meet the mead maker for Grimfrost! Bilberry shrub covers as much as 17% of Sweden’s landscape. It’s an essential part of the Scandinavian bear’s diet in their preparation for winter hibernation. The Bear’s Feast Brew consists out of bilberry juice, fermented together with another favourite among bears, Honey, into a dry beverage that resembles red wine. Serve it at room temperature to be consumed with main course meat dishes. The slight taste of forest, makes it especially good with game. Just the way a bear would love it. • Ingredients: Bilberry, Honey, Water and Yeast. In Norse mythology it was Kvasir’s blood that was mixed with honey in the creation of the divine Mead of Poetry. Grimfrost is a Swedish Company dedicated to making and selling authentic Viking products. 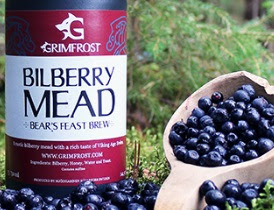 Grimfrost’s Mead has been developed together with Mjödhamnen. 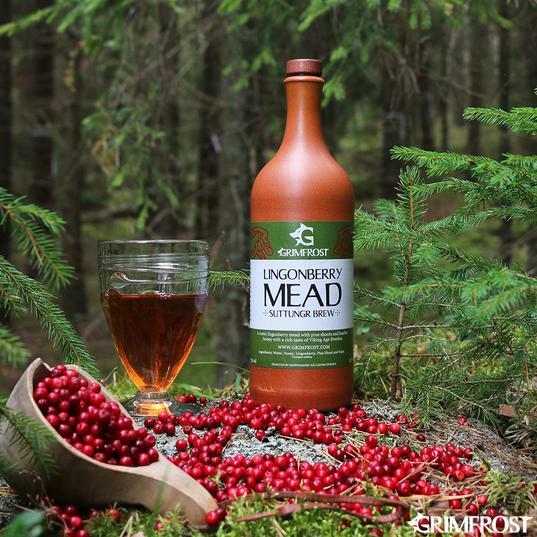 With it, we would like to invite you on a journey back to a time when mead was considered to originate from the gods. A pure, sweet honey mead with a rich taste of Viking Age Sweden. Swedish honey predominantly comes from wildflowers, such as white clover, raspberry blossom and lingonberry blossom. The Jarl’s Brew uses raspberry blossom honey, as well as the much rarer linden honey. In comparison with a dry mead, it contains twice the amount of honey. The mead has also matured up to two years before bottling, allowing it to find its prime. 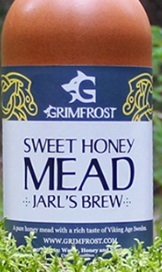 The Jarl’s Brew is a sweet mead that fits to be enjoyed after a meal, with dessert or on its own. • Ingredients: Honey, Water and Yeast. Honey has always been a rare and luxurious commodity. Jarl’s Brew holds enough honey for a jarl, a king or even a god.